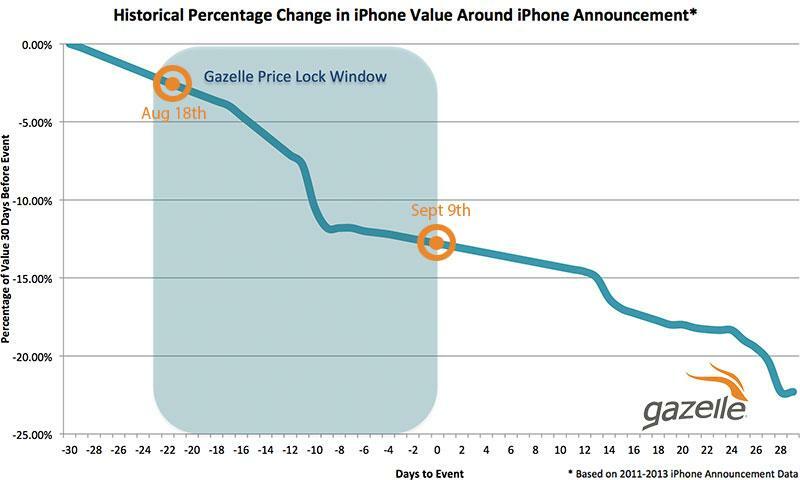 Last week, Gazelle began offering customers the ability to lock in cash trade-in prices ahead of Apple's anticipated Sept. 9 "iPhone 6" unveiling, and for the next 48 hours, AppleInsider readers can get an additional $10 cash bonus on their iPhone 5s trade in thanks to an exclusive partnership. The first day of Gazelle's 53-day extended price lock on iPhone trade-in prices was Monday, and commitments to exchange the iPhone 5 and iPhone 5s subsequently surged 2,800 percent over the prior week. The iPhone 5 was the most popular on the cash paying site, representing 40 percent of all items traded in. And for users planning to upgrade to Apple's latest and greatest, Gazelle is offering an exclusive deal for AppleInsider readers through Friday, Aug. 29th: when using this link (or the payout links below), Gazelle will pay out an additional $10 in cash over their standard value to anyone planning to trade in a current-generation iPhone 5s after the iPhone 6 is released. Once the price is locked in, iPhones committed to Gazelle don't need to be shipped in a prepaid box until Oct. 10, which is a few weeks after Apple's next iPhone is expected to go on sale. Apple is widely believed to be planning a media event for Sept. 9, and if the company follows its typical release pattern, the "iPhone 6" would be in customers' hands beginning Friday, Sept. 19. Customer excitement for the "iPhone 6" is expectedly high: Gazelle said it's seen nearly five times as many iPhones traded in over the last 10 days than compared to the 10 days before that. The iPhone 5 alone has seen its trade-ins spike 10 times over that same period. Gazelle was handling nearly five offers per second at the height of traffic when the extended price lock took effect on Monday. As can be seen in the AppleInsider Trade-In Price Guide (relevant portion below), Gazelle is currently offering lock-in values up to $340 for previous-generation iPhones in flawless condition. With no need to send in the iPhone until Oct. 10, users will likely be able to purchase and set up their "iPhone 6" before needing to drop their handset into one of Gazelle's prepaid shipping boxes.